Supply and a completed die. We’ve heard it all before - a new cutting tool promises earth-shattering productivity; the likes of which have never before been witnessed on this planet. By most accounts, these claims are exaggerated and result in disappointment when the tool is actually incorporated into the shop environment. But, then again, there are those tools that live up to, and even exceed what they promise. Product Development Technologies, Inc. (PDT), of Lincolnshire, Illinois is a global product development company with capabilities including design, tooling and manufacturing. In a quest for improved cycle times and cost savings, PDT’s machining of mold bodies had previously gone from conventional indexable milling using APKT square shoulder style inserts to a high-feed style milling cutter using TiAlN coated inserts. 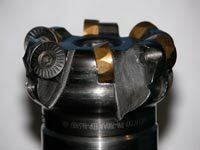 Then, in August 2004, PDT tried the Twincut Vario high-feed indexable milling cutter with the new LC280TT grade insert from LMT-Fette, (Cleveland, OH). For PDT, however, the Vario’s capabilities were not immediately recognized. A sample cutter sat on Vito Sarullo’s, PDT programming engineer/manager, desk for a month before it was tested. Persistence on the part of the LMT-Fette’s sales engineer, Martin Hazelhorst and Glen Korff, sales manager, Zenger’s Industrial Supply, a distributor of LMT-Fette products, convinced Sarullo to try the Vario by promising reduced machining time.“ When people use the Vario, their existing cutters can’t compete - hands down,” said Hazelhorst. The results were astounding. The machine cost of milling dropped from 12¢ per cubic inch to 6¢ per cubic inch. Tooling Costs dropped from 31¢ per cubic inch to 2¢ per cubic inch. The total cost for the operation went from 42¢ per cubic inch to 8¢ per cubic inch. The result is a savings of 81.6% from the Vario. “Our operation went from about 17 hours down to only 5 hours,” said Sarullo. PDT now uses the Vario with its patented Split Chip Technology to rough molds for automotive exhaust manifolds. The tool used to machine this 36” x 28” x 5”, #4140, 30 RcC, mold base has a 7” overhang and is being done in a Makino MCB 1210, horizontal 50 Taper with 25hp. Before discovering the benefits of the Vario, PDT tried a competitors’ cutter to mill their mold bases. “Using the Vario we went from 20 inserts to only 5 inserts per base,” said Sarullo. “I could go to my boss with the savings on inserts alone.” Hazelhorst outlined the advantages of the Vario LC280TT grade insert when compared to most competitors inserts. “A more expensive insert milling 500 cubic inches of steel could only run a half hour, it would fail due to heat, lose accuracy due to wear on its radii, and tear into the cutter body,” commented Hazelhorst. The Vario’s inserts can run one hour and forty minutes per edge, multiply that times eight edges and you realize a huge savings. PDT uses a 2.73” diameter Vario at cutting speeds of 457 sfm and 640 rpm with a feed rate of 123 ipm and 0.120” doc. This contrasts with PDT’s former cutting tool of 2” diameter that operated at 400 sfm and 764 rpm with a feed rate of 30.64 ipm and 0.200” DOC. The Vario’s patented split chip technology and unique 23? positive rake geometry, allows it to perform at 50% of the spindle load in this application, reducing wear and tear on the machine. Designed for roughing, the Vario uses exclusive Split Chip Technology to achieve high feed rates. “This is the perfect application for the Vario and it’s a quantum leap from where PDT started to where they are now,” said Korff. PDT experienced drastic processing time reductions - from 17 hours to 5 hours when roughing a mold base pocket with the Vario. The Twincut Vario’s split chip technology offers a patented geometry where two axially and radially offset cutting edges combine to make the cut. The upper and lower rows of cutting edges each have different angles of approach and cutting depths. This produces a technically superior chip cross-section with a four times smaller width to height relationship. As a result, required cutting forces can be reduced. Aggressive machining such as that performed at PDT typically warrants strict monitoring of the spindle by an operator. In the case of the Vario however, reduced risk of insert failure results in greater peace of mind and use of time. “You can actually walk away for a time and not have to worry about the insert tearing up the base or cutter body,” noted Hazelhorst. LMT-Fette’s Vario also overcomes what was once considered a given – excessive noise and vibration. “Our shop shares a wall with our CMM department. Reduced interference is important when using accurate measuring devices,” said Sarullo. The Vario’s Split Chip Technology results in quiet operation and minimal vibration, even in unstable machining conditions. LMT-Fette’s Twincut Vario proved to provide the productivity promised by the salesperson and more. 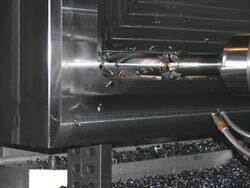 It yielded dramatic improvements in reduced machining time, lower cost for tooling, longer tool life, reduced vibration and noise, provides operators ability to walk away from the machine, reduced programming time, less wear and tear on the machine and improved safety yielding great peace of mind. It’s not that often that you get the satisfaction of finding something that is better than promised. For more information on LMT-Fette products, visit www.lmtfettetool.com, contact LMT- FETTE, INC., 18013 Cleveland Parkway, Suite 180, Cleveland, Ohio 44135, Phone: (800) 225-0852, Fax: (216) 377-0787, or e-mail lmtfette@lmtfette.com. 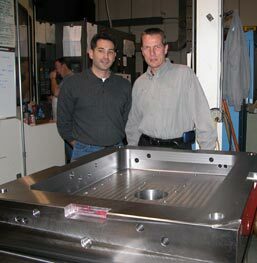 To learn more about Product Development Technologies, Inc, visit www.pdt.com, contact PDT, 600 Heathrow Drive, Lincolnshire, IL 60069, Phone: (847) 821-3042, Fax: (847) 821-3030, or e-mail Vito Sarullo at vito.sarullo@pdt.com. To find out more about Zenger’s Industrial Supply, visit www.zengers.com, contact Zenger’s, 11132 West Grand Avenue, Melrose Park, Illinois 60164, Phone: (847) 455-5741, Fax: (847) 455-5731, or contact Glen Korff at gkorff@zengers.com.